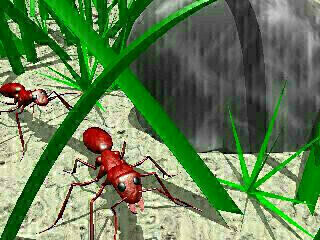 Povray (Persistence of Vision Raytracer) http://www.povray.org/ puts light into computer graphics. The light reflects from surfaces, shadows are created and you see trough glass. 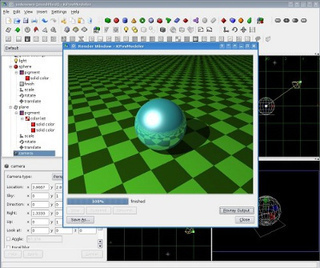 Povray itself has no graphical user interface, POV-Ray scenes are described in *.pov files containing a special text language called scene description language. You will type commands into a plain text file and POV-Ray will read it to create the image. It is also possible to create *.pov files with other tools.. There is a front-end emerge kpovmodeler and see http://www.kde.org/applications/graphics/kpovmodeler/. You need a camera, light and an object with some material properties to get something different than a dark black picture. Run the tutorial that is available in the help menu, to create a picture as shown in the picture above. To save the picture use the desired and supported extension as *.jpg and kpovmodeler converts it automatically to this format.